The 2016 Summer Olympics in Rio are starting! With that in mind, let’s take a look at China and what sports they traditionally have success in during the Olympics. Why Is China So Successful At The Olympics? Some of it might be due to the training methods. Many Chinese athletes are scouted, and then separated from their peers and put into training facilities. Athleticism and the spirit of the Olympics align very closely with Chinese values. Confucius values believe that hard work and perseverance gets results. With this in mind, they follow a long-term athletic development model that has proven to work for them. Every movement and technique is repeated and perfected until it is optimized, which is why they succeed in finesse sports such as gymnastics and diving. The government is also heavily invested in the Olympic athletic program. The exact figure is unclear, but it is estimated to be the highest funded high performance program in the world. There is plenty of pressure to win gold at the Olympics. Winning a gold medal will unlock millions of dollars worth in sponsorship deals and advertising opportunities. For example, Lei Sheng won his first and only Olympic gold medal in London in 2012, and he has appeared in commercials for BMW in China. "[Chinese gymnast] Deng Linlin was living and breathing for a gold medal and it didn't come," says Low to BBC. "Losing face and respect in Chinese society still matters. She would be lauded for being a potential world champion and when it didn't happen, she lost face. "You have to understand Chinese culture. They will be significantly shameful of the fact they have failed to live up to what they believed, and were told, they could do." Here are the events that China traditionally sweeps at the Olympic Games. 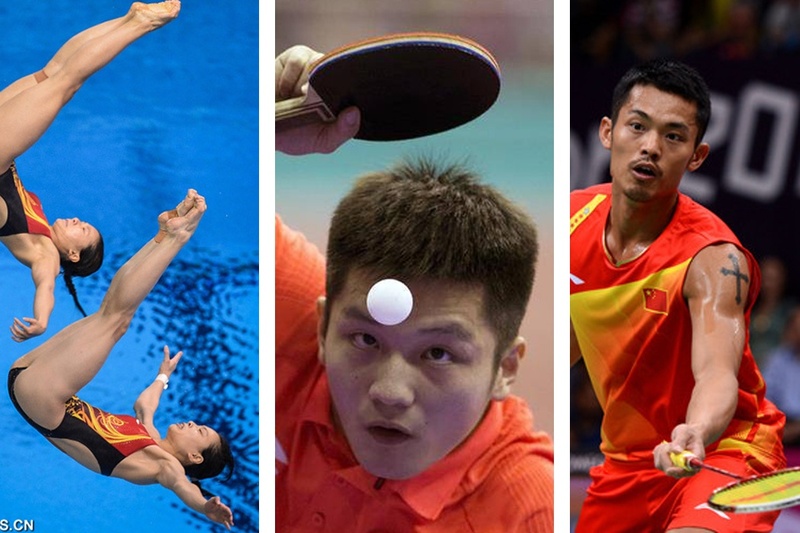 As China’s national sport, table tennis is a point of pride for the Chinese. (Few people know that table tennis, also known as ping pong, is actually a British invention rather than a Chinese one.) In the 2012 London Olympics, China won all 6 gold medals for this sport. Countries that could contest China for the gold medals are Japan, Singapore, and Germany. In the 2012 London Olympics, China won all 5 gold medals for badminton. Even without their No.1 team, China’s pair Tian Qing and ZhaoYun Lei cinched the gold. 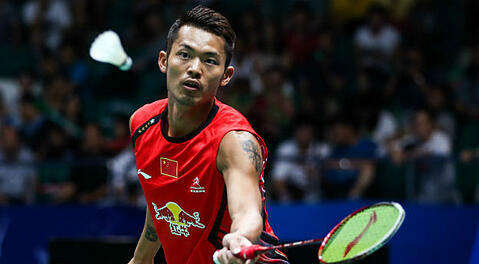 Lin Dan is one of the most recognizable faces in Chinese sports media. He is a two-time Olympic champion, five-time world champion, and six-time All England champion for the Men’s Singles badminton event. He is after his third gold medal in Rio, surprising many WeChat fans and users on Chinese social media, who say he has “earned his retirement.” Lin Dan’s greatest rival, Lee Chong Wei from Malaysia, is also competing. Tian Qing (defending Gold in Women’s Doubles) will not be participating. Instead, the Luo twins will be making their Olympics debut. 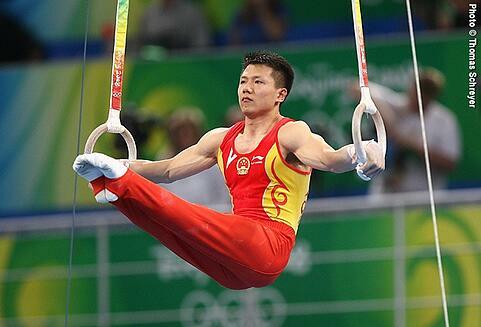 In London 2012, China won a total of 12 medals in gymnastics events, 5 of them gold. China has always been strong in the gymnastics program. 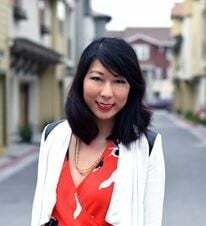 Part of it may be due to genetics (Asian people tend to be more petite, thus having a lower center of gravity and a form more forgiving to the sport.) Another part of it may be due to famous athletes in the sport in the past, such as Li Ning. Li Ning famously won 6 medals at the 1984 Summer Olympics (the first time China PRC attended the Olympics.) Afterwards, he went on to create the mega sports brand, Li-Ning, which has sponsored many athletes including Dwyane Wade and Shaquille O’Neal. China’s gymnastics training camps were the ones that were under controversy for “robbing children of their childhood.” Children as young as 5 years old are scouted for future Olympic glory. China has also been under major scrutiny in the past for possibly using underage gymnasts to compete. Because gymnastics tends to have a high turnover rate, only Zhang Chenglong will be the only veteran Olympian from the Chinese team. Chinese gymnastics training is said to be closely linked to the diving program, since the two utilize similar training methods and techniques. Gymnastics training centers often have a diving springboard (without water) so trainees can get accustomed to the feel of a springboard beneath their feet. 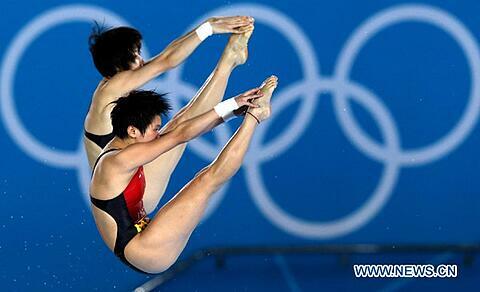 In London 2012, China took home 10 diving medals, with 6 of them being gold. Though we previously mentioned that China tends to succeed in finesse sports, weightlifting has a lot of movements that require perfection over hundreds of repetitions. That is possibly one of the reasons why China has success in this category. 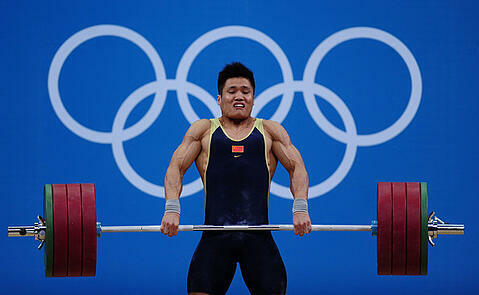 In London 2012, China claimed a total of 7 medals in the weightlifting category, with 5 of them being gold. 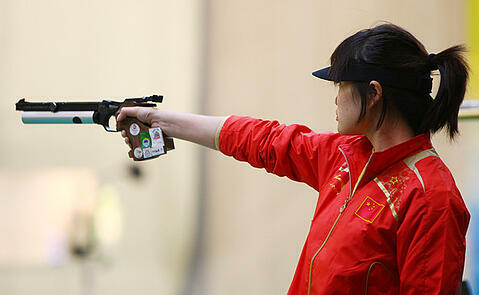 In London 2012, China claimed a total of 7 medals in the shooting category, 2 of them being gold. Swimming became a hot new sport for the Chinese at the London 2012 Olympics, largely due to two new Chinese swimmers’ shockingly impressive performances. Sun Yang became the first Chinese male swimmer to win a gold medal. He was also the only other Olympian to win two individual gold titles in London (the other being Michael Phelps.) Sun Yang won the gold in men’s 400 and 1500 freestyle, setting a new world record in the latter. He is the favorite to reclaim these two gold medals he won last Olympics, as well as attempt to turn his silver in the 200 into a gold. Ye Shiwen won the gold in women’s 200 and 400 individual medley, breaking a World Record and an Olympic Record in the process. She quickly became known for impressive sprinting in the final leg of the race, comparable to the speed of American swimmer Ryan Lochte. Ning Zetao is a Chinese swimmer making his Olympic debut this year. He has garnered plenty of attention already, though perhaps for other reasons. 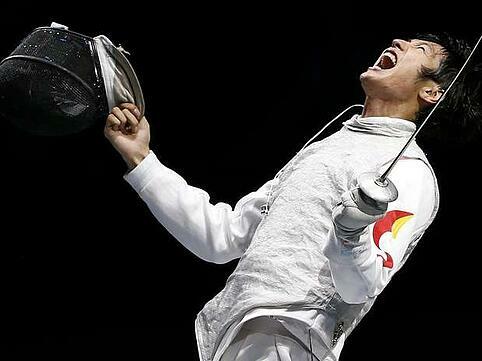 Only four years ago, there were 300 people participating in the nationwide fencing club league in Shanghai. Now there are 3,000. With the popularity of the sport growing in China, there are sure to be more Chinese athletes shooting for the gold in fencing events. Lei Sheng, 32, who won the men’s individual gold medal in foil at London 2012, is China’s flag bearer at the opening ceremony in Rio. He is the first non-basketball player to be able to do so for China, reflecting the progress fencing has made in growing in China. Also present from the London 2012 team are Sun Yujie and Xu Anqi, two of the four who won the women’s team epee event four years back. In London 2012, China snatched up 2 medals for archery, though neither were gold. 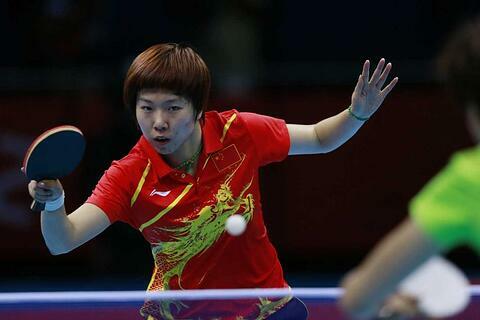 Xing Yu, 25 narrowly lost in the round of 32 at the London 2012 Olympics, and did not progress. 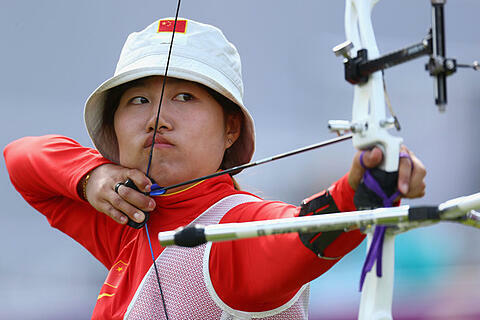 The other five participating archers were not part of China’s team in London. None of China’s eleven boxing athletes competing in Rio won anything in London. 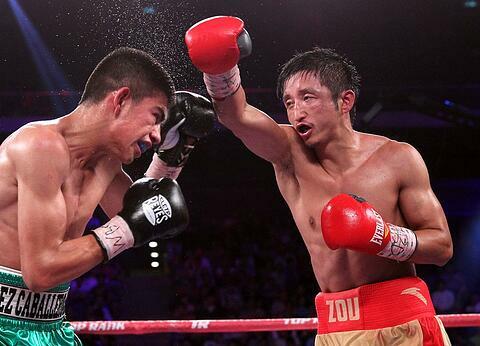 However, they do have the inspiration of Zou Shiming, who won the gold in light flyweight in London. In London 2012, China won 3 medals in cycling for the women's keirin, women's team sprint and women's individual sprint events. Guo Shuang and Gong Jinjie set new World Records in the women's team sprint, but were disqualified for an "early relay" and awarded the silver. Their coach strongly protested and claimed they were "robbed of the gold." At the 2016 UCI Track Cycling World Championships, China won women’s and men’s places in team pursuit. Zhong Tianshi, 25, stood out, beating fellow China teammate Lin Junhong to win the women’s sprint. She is now well-poised to grab the gold at Rio, and become her country’s first Olympic track champion. 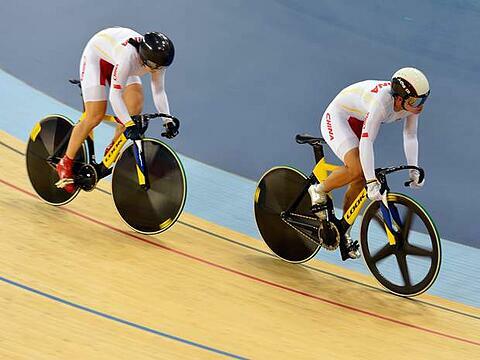 China has won two places in both women’s sprint and men’s keirin, as well as one spot in men’s sprint. What sports will you be watching? Let us know in the comments!